It Is! It Is!! It Is!!! Strong Sentiment on Customer Service. The legend of Italy’s wine region with the peculiar name of Est! Est!! Est!!! begins with a bishop who on his way to Rome, sent a servant ahead to find places with the best wine for the bishop to enjoy. The servant would scrawl Est (Latin for “It is”) on the door of an establishment where he deemed the quality of the wine to be to the bishop’s liking. The tale continuous that he was so impressed with the wine being served at an inn in the town of Montefiascone, that he scrawled Est! Est!! Est!!! on the door. (Read more) He did not want to leave any doubt that the wine there was good. Well, I almost feel as strongly about the importance of customer service. It is! It is!! It is!!! a crucial part of any business. Regardless of industry, product, business or customer. This week I attended the The Business of Wine and Food Tourism Conference in Stellenbosch. A wonderful initiative by which the industry got an opportunity to get together and debate the various facets of tourism: international best practice and benchmarks, getting to grips with digital aspects, the strategy and cooperation required and yes, the importance of service excellence. We might be in the wine industry, tourism industry, hospitality industry, but really, we are in the service industry. And while it might sound less glamorous, it is something to be celebrated. Not only can we ensure memorable experiences of the winelands and our individual estates, restaurants and offerings, but through service excellence we can form a positive opinion and image of South Africa. I once heard the quote: “Customer service is an attitude, not a department”. How true is that. Customer service needs to be at the heart of each employee. And at this week’s conference, Destinate’s Mariêtte du Toit-Helmbold said: “Service delivery is the Achilles heel of the tourism industry.” Indeed, because here, more than in any other industry, it is about so much more than the offering – it is about the experience. Of course there are many ways that this can and has to be addressed, but we as an industry can use the importance of exceptional customer service, to address unemployment in our own communities. Why don’t we get more apprentice programs, on the job training, skills development initiatives… and get our communities involved. Service is about attitude, yes, being helpful, having a warm and welcoming manner, staying friendly in the face of unrealistic demands and keeping cool when faced with bombastic behaviour. It is, however, about more than that. It is also about being informed and empowered. Confident people are better at service delivery. Your staff is confident when they are properly trained, well-informed and well-groomed. It requires dedication and some budget, but recruiting from our local communities through apprentice programs and on the job training can have wonderful long-term results. I’ll end with this example of Angela Williams. Angela, a young girl from the Franschhoek community, started her career at La Motte 24 years ago, as a cleaner in the tasting room. 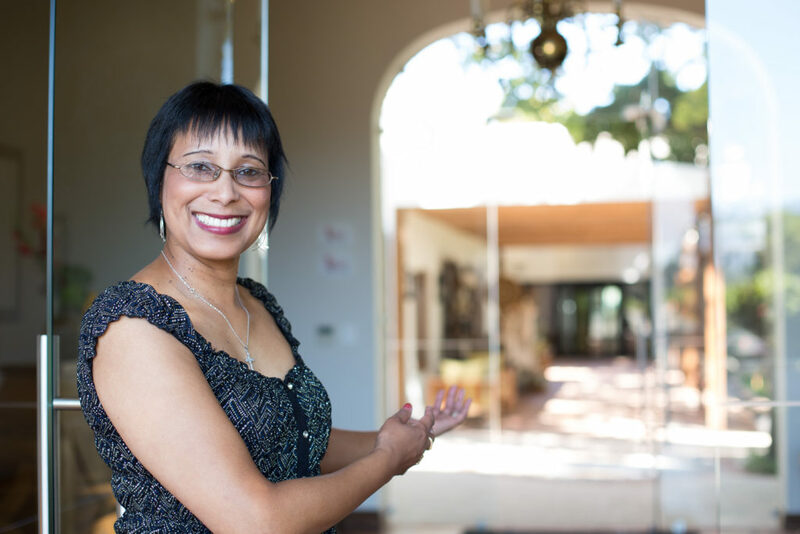 Through La Motte’s training en development program, she quickly moved on to become a tasting room assistant, later tasting room co-ordinator and then, since 2010, she has been heading up La Motte’s guest reception, welcoming close to every one of the 80 000 guests visiting the estate on an annual basis. From day one, Angela had a can-do attitude and the wonderful ability to stay calm and friendly in the most challenging of situations. Developing her potential, she was enabled by training, front-line PR information sessions, image consultancy, to name but a few to ensure that she can do her job at the best of her ability. On Wednesday, Angela received a special Judges Commendation for Outstanding Service in the Wine Tourism Industry by the Great Wine Capitals of the World Best of Wine Tourism judging panel. And the La Motte Facebook page announcing her award received 184 likes, more than 40 comments and 13 shares – one of the most successful Facebook posts ever for the estate, and testimony to just how popular she has become to those who visit La Motte. Yes, customer service is very important for your business and your customers, but it can also be instrumental in creating jobs, developing potential and uplifting communities!